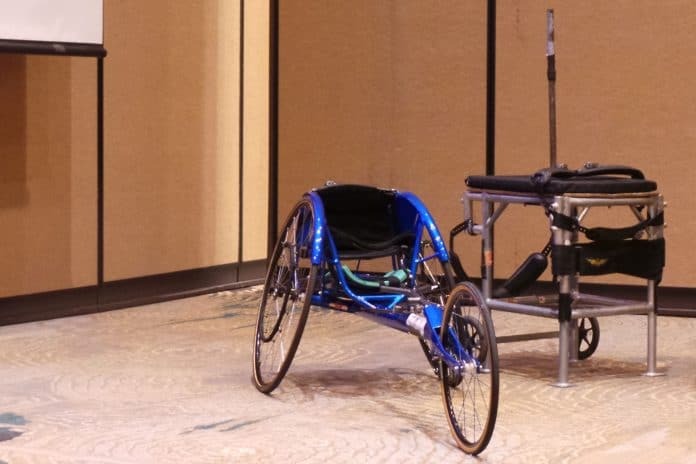 A wheelchair that is used for adaptive athletics on display during the 2019 TSD Conference. FRISCO, Texas — A breakout session during the TSD Conference discussed options for removing barriers to transporting adaptive student-athletes. Those are who compete in sports that include or are designed specifically for people with disabilities. Presenter Dianna Gates, a physical therapist at Caddo Parish Schools in Shreveport, Louisiana, reported during the Monday session that the number of sports teams available to these students are increasing nationwide. Gates discussed the American Association of Adapted Sports Programs and progress being made nationwide for the athletes. Joining her was Doug Garner, assistant director of recreation at the University of Texas at Arlington, who recently returned from transporting over 30 wheelchair athletes to a national basketball tournament. “Adaptive sports really are sports,” he proclaimed to attendees, providing a glimpse of the opportunities awaiting students during and after high school. After watching his players participate over the years, he pointed out that they want to compete and succeed just as much as other athletes do. “These kids are athletes,” he stressed. He said he has also learned “tons of lessons along the way,” while developing sports programs. The number of men’s collegiate adaptive basketball teams is currently 10, with four women’s teams, but the men’s tally is soon expected to jump to 20, Garner predicted. Students with disabilities currently have a sports participation rate that is an estimated 12 to 48 percent less than their counterparts, according to a 2010 Government Accounting Office (GAO) study. Also relevant is the 2013 “Dear Colleague Letter” from the U.S. Department of Education’s Office of Civil Rights. Those documents stress the need for schools at all levels to make reasonable accommodations for athletes with disabilities on existing sports teams, the speakers noted. And if that is not possible, then a separate team must be created. Garner conceded that out-of-town travel with wheelchairs has been especially difficult, as it can be difficult to find wheelchair accessible buses or vehicles that can accommodate the student-athletes’ equipment. Another ongoing challenge for transporters is road trips that require some student-athletes to bring along their service or support animals. But the process is “all about inclusion” of the students, no matter what are their physical limits, injuries or skills. He said he does stress to them that ultimately, “They are here to get an education,” and to graduate. That is most important, from his point of view, as well as moving on from college into the workforce and achieving life independence.